This interesting Neotropical gecko is immediately recognizable by its large size, with a body length of up to 12 cm, and its large, swollen tail, approximately the same length or slightly shorter than its body; females are larger and more robust than males. It has short, robust legs with flattened toes and extensive basal webbing. The undersides of its toes are covered in lamellae, used as friction pads to cling to smooth vertical surfaces. Turnip-tailed Geckos are variable in coloration, from a mottled dark gray to orange-brown, and are capable of changing color depending on their mood and surroundings. Mottled and banded markings aid in camouflage against tree bark. During the day, roosting Turnip-tailed Geckos tend to be a lighter color than at night. Their pupils are vertical and elliptical in shape, and they have no eyelids. Turnip-tailed Geckos are nocturnal, and are often found clinging to tree trunks up to 20 m above the ground. They spend their days concealed in dark tree grooves and cavities. At night, they vocalize by giving a series of 15-25 chirps and clacks, used for territory establishment and defense. 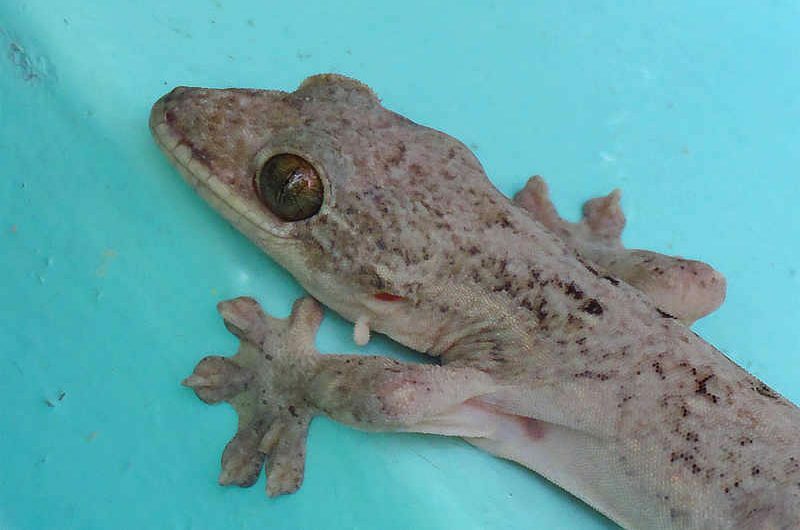 Turnip-tailed Geckos are insectivorous, and feed on cockroaches, grasshoppers, beetles and spiders. Their reproductive season is during the rainy season from May to September. After mating, a female lays 1 or (rarely) 2 eggs which she buries in slightly moist substrate or deposits in a tree trunk. Young hatch 13 days later. Turnip-tailed Geckos use their large tails for a few different uses. The tail is primarily used in fat storage. They wave their tail when threatened to show aggression. They can also shed their tail to distract predators and avoid being eaten. In addition to waving their tail when threatened, they may also open their mouth, displaying their blue tongue, and will bite if provoked. Turnip-tailed Geckos are widely distributed in lowland humid forests from Mexico south through Central and South America into Brazil, and can be found on several Caribbean Islands. They can be found around all three Canopy Family Lodges.